The tiger, Panthera tigris, is largest of all the big cats. A tiger’s roar can be heard as far as 3 kilometers away. Tigers are endangered – there are less than 4,000 of them remaining in Asia. According to a National Geographic article, in the early 1980’s it was estimated that nearly 8,000 tigers remained in the wild. But now there are less than 4,000! We are losing tigers because of loss of habitat, increasing human population, poverty (which causes people to poach – illegally hunt animals), failed conservation plans, and the Chinese black market for tiger parts. 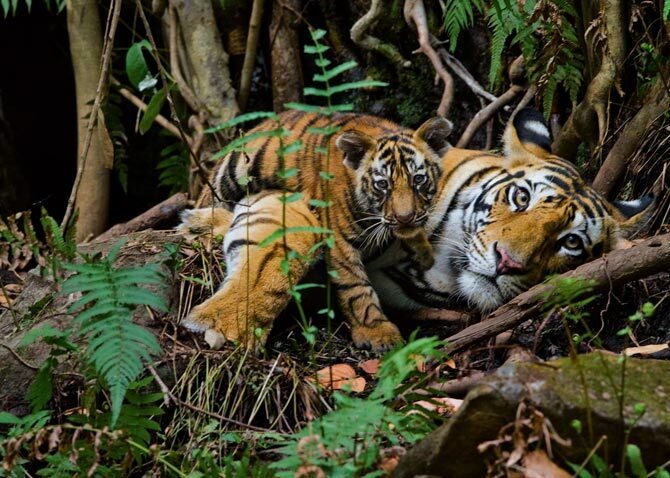 Now, because there are so few, seeing tigers in the wild is now mostly a tourist experience—the Bengal tiger is not only India's national animal but also one of the country's largest draws. In the past, Tiger hunting was legal in India until the early 1970s and people could shoot a tiger for “maybe a hundred rupees – a couple of dollars” according to a former game warden. There used to be a private hunting estate that is now a tiger reserve called Ranthambore. It is one of 40 tiger reserves in India. Interestingly, Ranthambore is surrounded by the original containing wall of the hunting estate and there are romantic maharaja-era ruins scattered throughout the reserve. One problem with these reserves; however, is that they are like separate islands over the landscape. Tigers can range over a hundred miles so they often want to leave the reserve to go hunting or to find a mate, but then they enter dangerous areas where they are not as well protected. So, conservationists want to make corridors that connect the reserves so tigers can safely go from reserve to reserve. The largest tiger reserve in the world is in northern Myanmar. It is called Hukawng Valley Wildlife Sanctuary. Up until recently, tigers were a regular part of the residents’ lives as they would often see them and hear their roars at night. Among the Naga tribes　people in northwestern Hukawng, tigers were called Rum Hoi Khan—which means, the King of the Forest. The people believed they had a “treaty” with the tigers. The Naga people used to call male tigers Grandfather, and female tigers Grandma. They believed tigers were their ancestors. However, now, the younger generation mainly knows the tiger from educational conservation stories rather than through stories passed down by generations. One of the best tiger success stories has taken place in Huai Kha Khaeng, Thailand where their tiger numbers increased from 20 to 160 in 20 years. 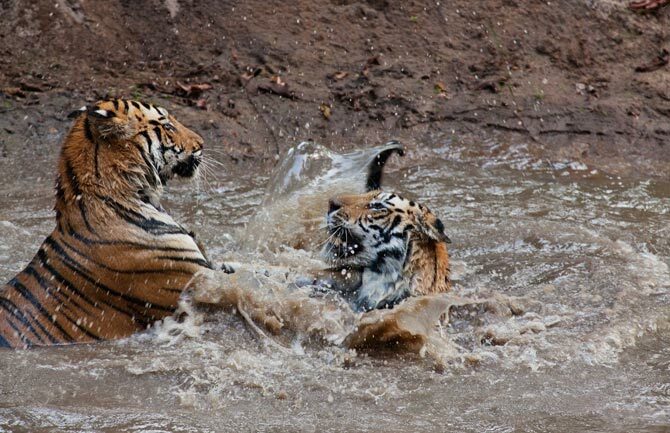 It used to be an area of great concern, but now it is seen as one of the world’s best tiger sites. The people in Huai Kha Khaeng were dedicated to saving the tiger. The officers took a strong interest and personally invested in their work. 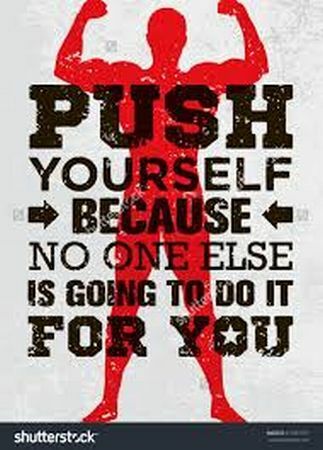 Professional pride, motivation and high morale were important aspects in their success story. In my opinion, it is sad that the tigers could go extinct. 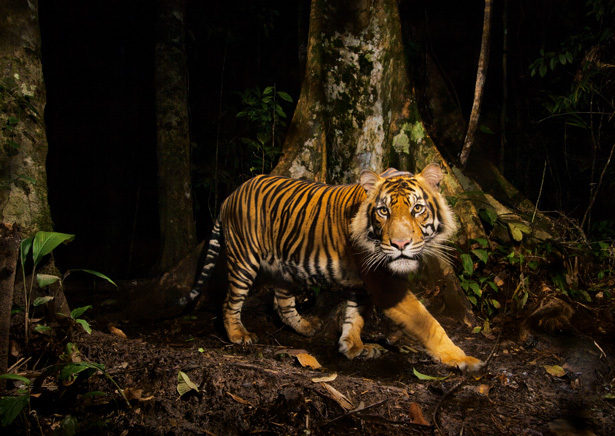 It is difficult to understand how people can poach tigers knowing that they are endangered. I guess if they are very poor, then they must feel like they don’t have any other option for making money. There also seem to be many factors that make the situation complex. In the article, I enjoyed reading about the Naga tribes people in northwestern Hukawng and their relationship with the tiger. The concept of having a treaty with tigers or with nature is interesting. It seems like if we would treat the earth with respect then it would treat us with respect. I wonder if there are similar concepts with regard to nature and animals in Japan. If there was a “King of the Forest” in Japan, what would it be? Bears? or maybe it would be something cuter like cats or dogs. Although they don’t live in the jungle, they seem to be an important part of Japanese culture. What do you think is the most majestic animal in Japan? If you could choose a “King of the Forest” for Japan, what would it be? The success story at Huai Kha Khaeng and the officers who went beyond the call of duty was also interesting. These officers not only took pictures of the tigers and tracked them, but they also took pictures of natural scenery and habitat while on duty – just because they loved the outdoors. They seemed to take pride in their work and genuinely cared about the whole habitat – including the tigers. I think this is an important lesson that we could apply to other environmental problems too. I hope one day we will be able to see the natural environment as the complex system that it is and find our right place in it.